KEITH Austin (foreground) and Roderick Eime shooting the breeze. couldn't go uphill – until Ole Evinrude came along. would do a victory lap with this pet hog. TRAVEL writing colleagues have told us of some pretty bizarre things they've got up to in that search for the Holy Grail of travel stories, and we sometimes look back in wonderment at the more stupid we've done too – from bungy-jumping at 66 years of age and with a dodgy ticker, to shuffling with crook knees and hips with a couple of unleashed lions on a bush track in Zimbabwe at even greater dotage. 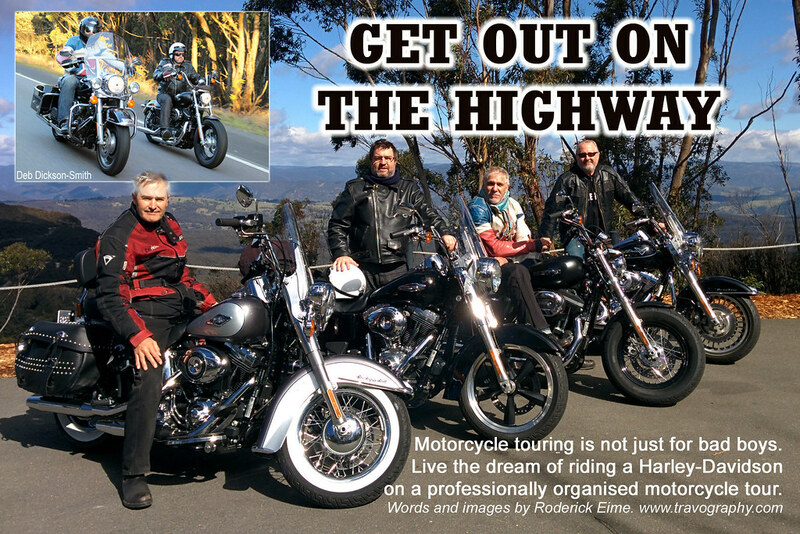 But when fellow scribe Roderick Eime mentioned recently he'd teamed-up with some other writing mates to rent themselves a small fleet of Harley-Davidson motorcycles and take to the open road, we thought he – and his colleagues – had finally lost it and crossed to the other side. 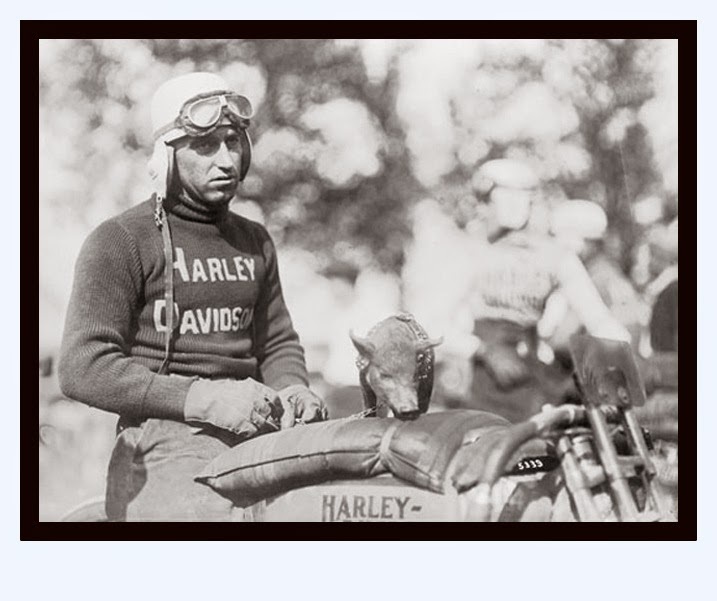 Interestingly the name HOG that's become synonymous with the throaty Harley-Davidson actually goes back a long time before the Harley Owners Group was even thought of: a team of Harley motorbike racers in Kansas in the 1920s were dubbed 'The Wrecking Crew' (because of their demolition of opponents) and would do victory laps after each win with their team mascot, a pet pig (in America a hog) happily standing in safety harness on their lead bike's petrol tank. 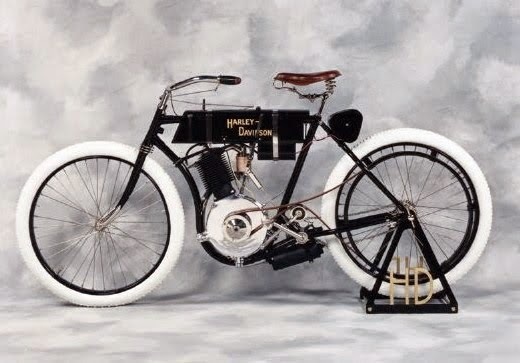 Today the Harley-Davidson is the bike of choice of some folk unlikely to list knitting or bird-watching amongst their hobbies, just about every State police force in America, and groups and individuals from Australia to Zimbabwe who simply love their bikes and the wide outdoors. When William Harley and his mate Arthur Davidson (later joined by Arthur's brothers Walter and William) constructed their first motorised-bicycle in a 3m X 4.5m shed in 1903 and found that its engine they'd built themselves was too weak to go uphill, they called on a friend to help beef it up – Ole Evinrude, who went on to build the world's first marine outboard motor. The rest, as they say, is history and they'd hardly have envisaged that their little shed would grow to an empire employing 6000 workers producing 261,000 motorbikes annually by the year 2013. But back to Rod and his mates. 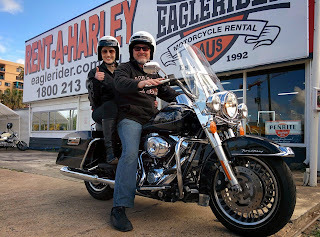 Having ridden motorbikes since he was ten years of age, but never a Harley, he says that when he went into the Burwood (Sydney) store of EagleRider Motorcycles he must have looked like an awestruck kid in a very expensive toy shop. But he says EagleRider's owners, Will and Santina Keith who are both factory trained by Harley-Davidson in America, quickly assured him that while the big steel and chrome Harley was a heavy machine, it was superbly balanced and easy to ride. 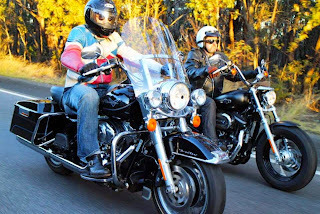 Roderick signed off on the rent of a 1200cc Sportser® and nervously headed into chaotic Parramatta Road traffic – and next day, stout of heart, for a 200km return spin up to the Hawkesbury River. "I was exhilarated and in surprisingly good shape for an older bloke with a dodgy back," he now says. EagleRider was launched in America in 1992 and here 12 months ago. 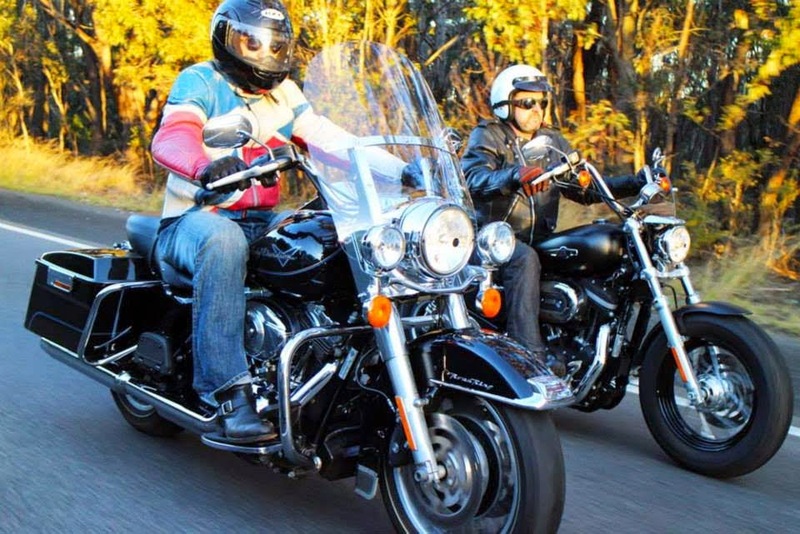 It has a range of fully-guided 6- to 12-night rides out of its bases in Sydney, Brisbane and Mackay (with more planned,) with motorcycle hire, accommodation and most meals included in prices that start from $2591.